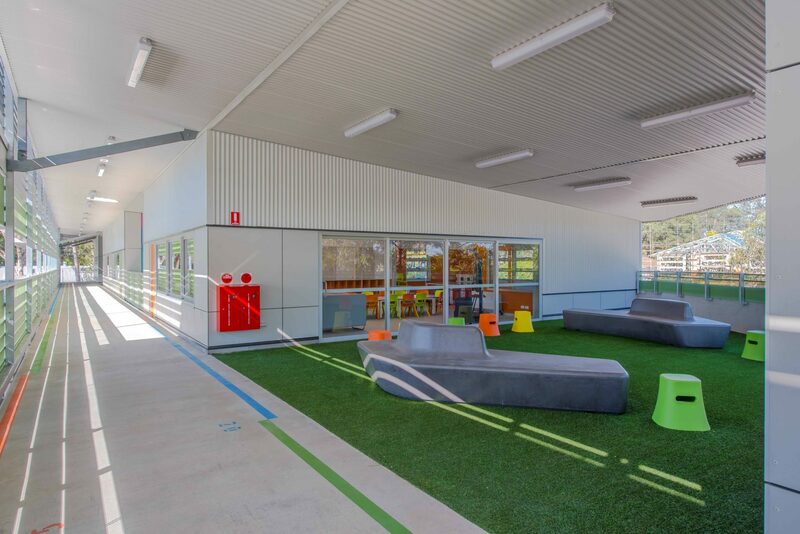 To accommodate for future student growth Killara Public School upgrade includes 8 new homebases and a new sports court. 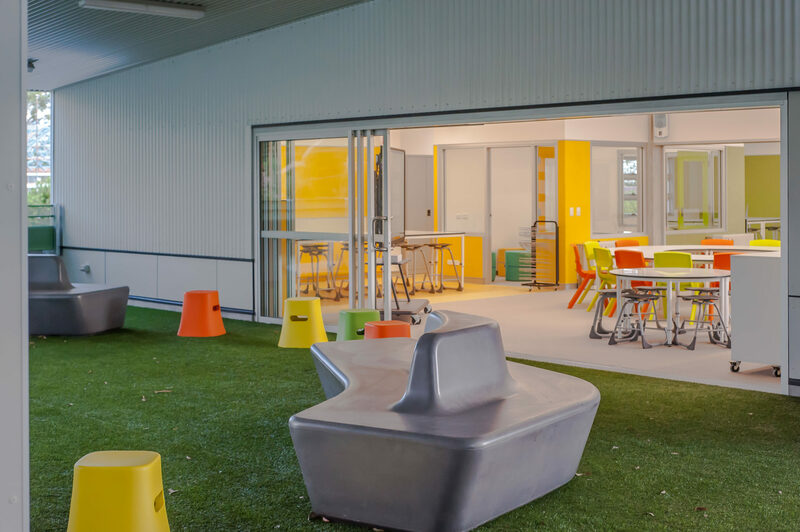 The new building provides a new main entrance from Ridgeland Avenue, improves the school’s street presence and unifies previously under-utilised open space with the removal of 5 portable homebases. 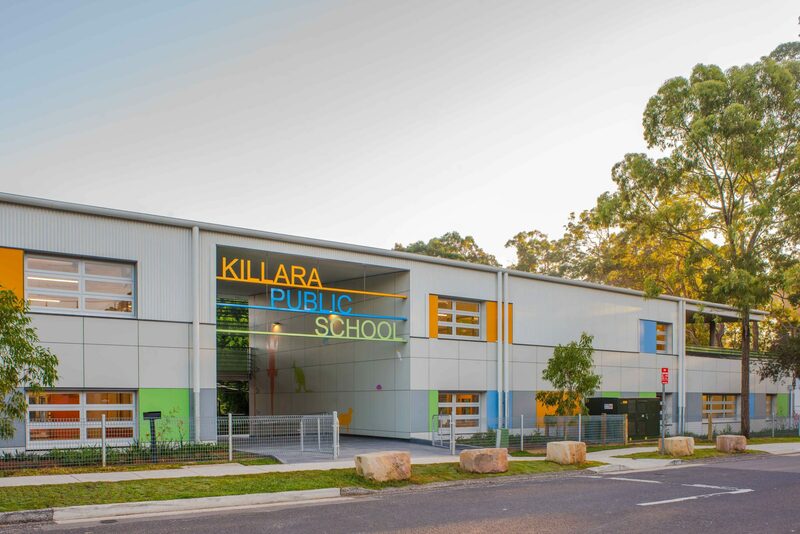 Killara Public School is located in a quiet, leafy residential suburb on Sydney’s mid north shore, backing on to Gordon Golf course. The natural bushland setting establishes a strong connection with nature. 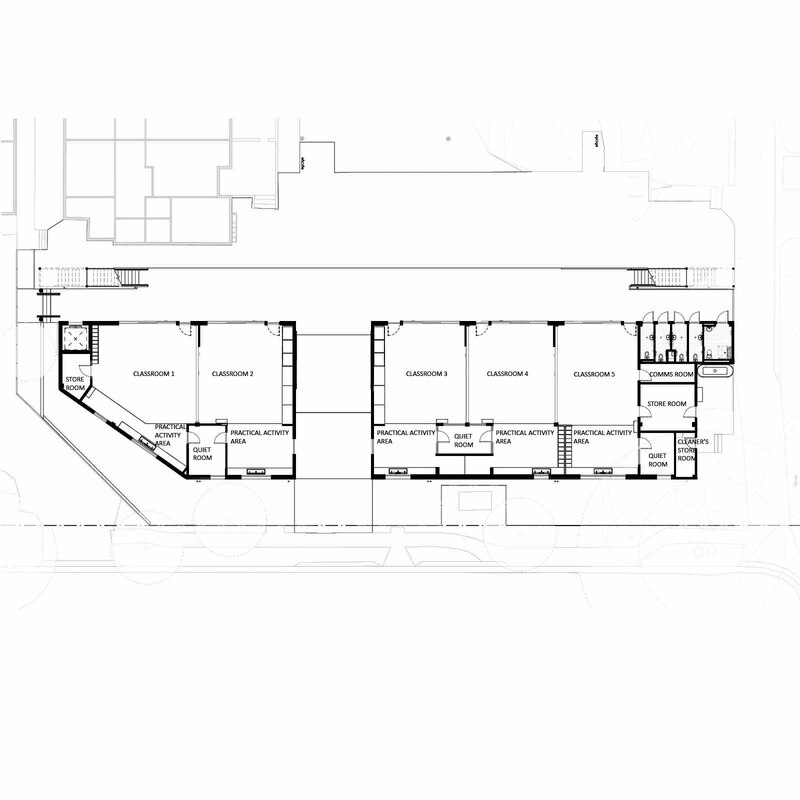 With this in mind the new building was situated on the main street frontage on previously disturbed land, to minimise tree removal and have as small a building footprint as possible. 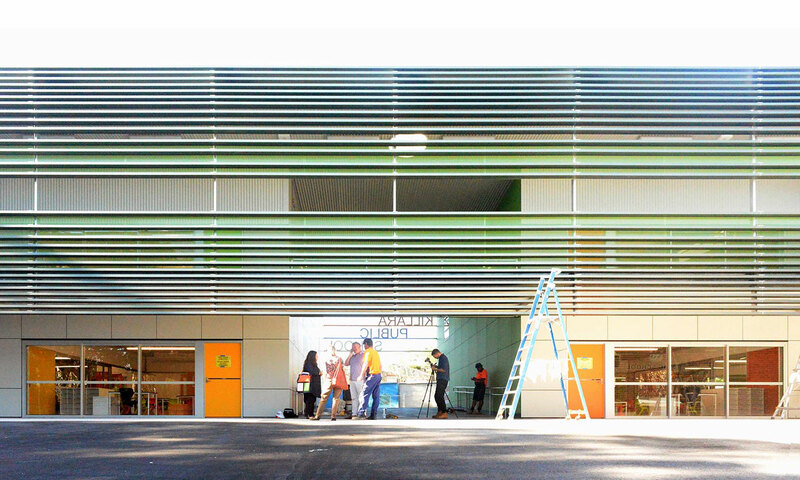 The new school building stands prominently on Ridgeland Avenue with a new covered, double-height entrance in the middle. 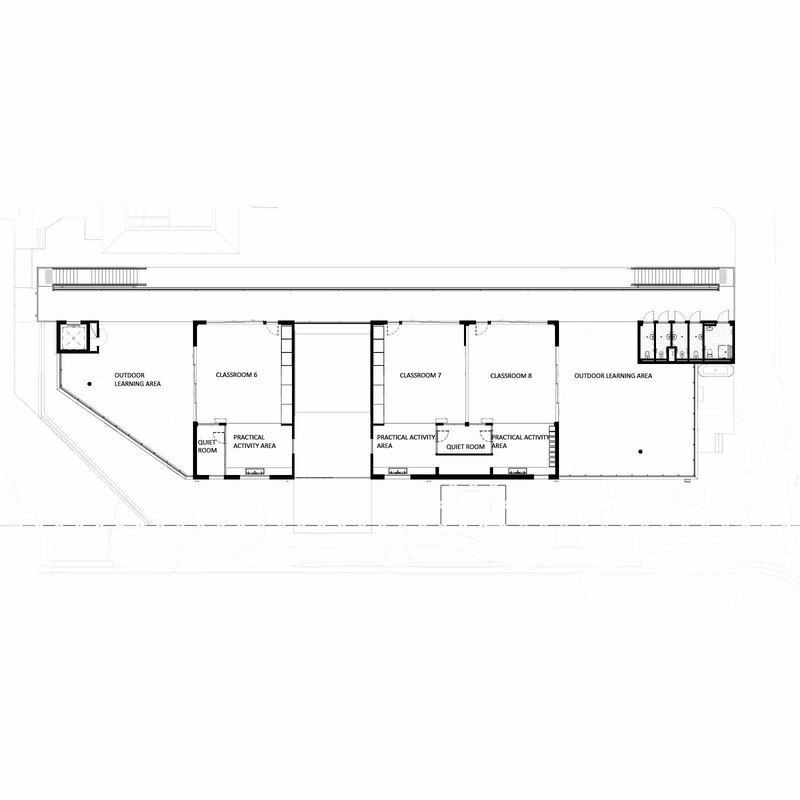 The narrow shape of the 2-storey building minimises the building’s footprint yet provides 8 class rooms, practical activity and storage spaces. 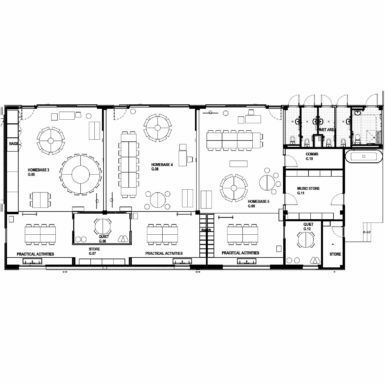 The ground floor class rooms are occupied by younger students, whereas the older students are housed on the first floor. 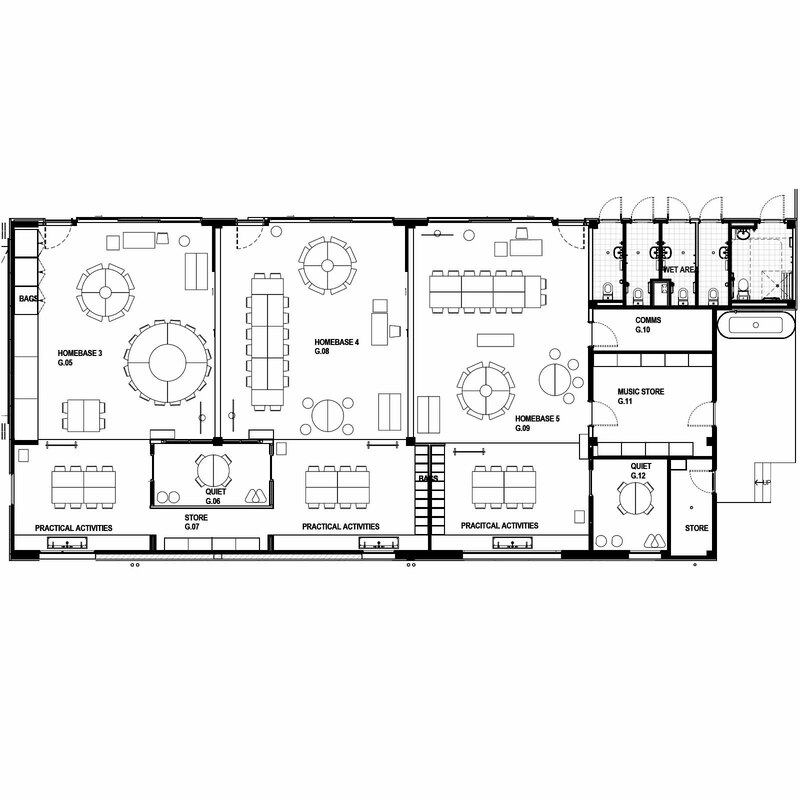 The first-floor class rooms are accessible via lift as well as by two stairways, creating equal access to all areas of the addition. 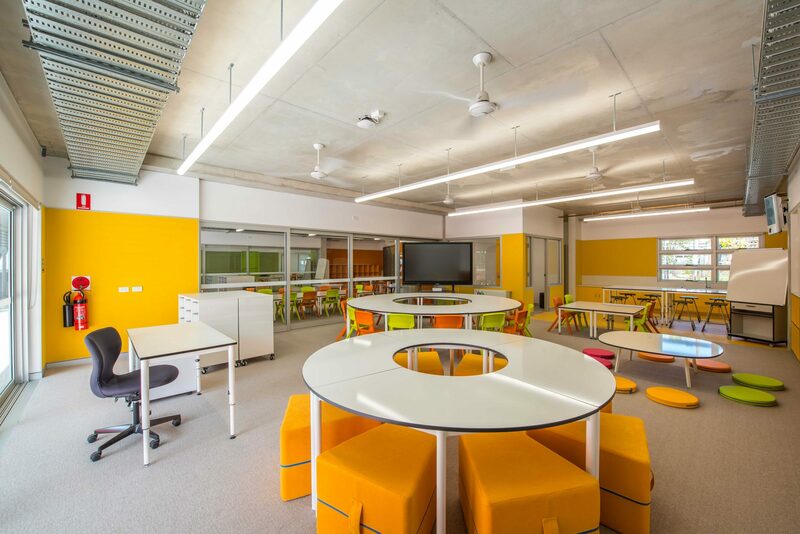 The class rooms have been designed to allow for flexible learning and collaborative teaching. 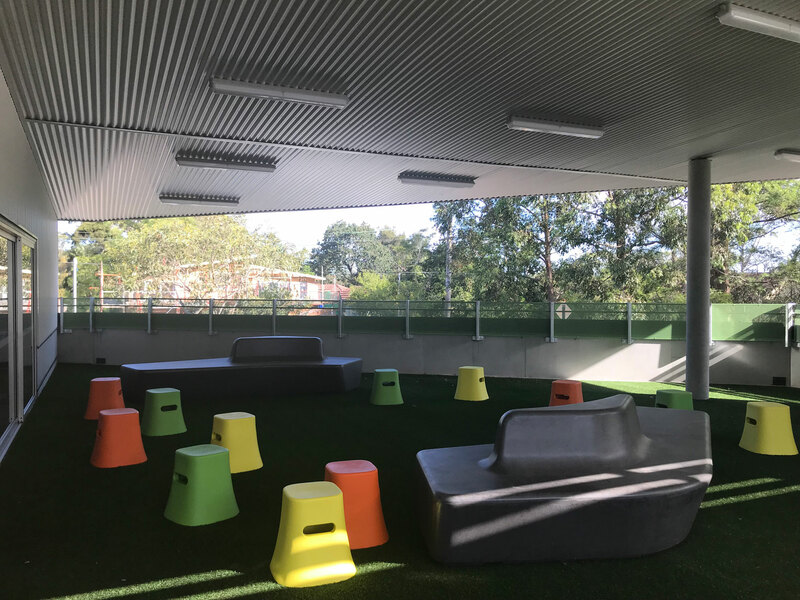 Outdoor learning spaces on the first-floor terraces maintain strong connections to the natural setting; open on three sides, the terraces sit within the tree canopy as well as connecting directly to the adjacent homebase. 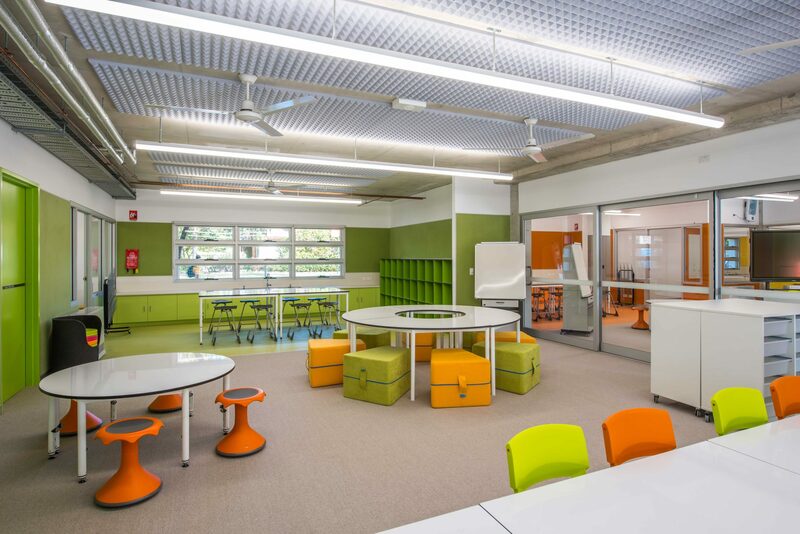 Sliding glass doors connect homebases internally and provide opportunity to open rooms up for collaborative teaching. 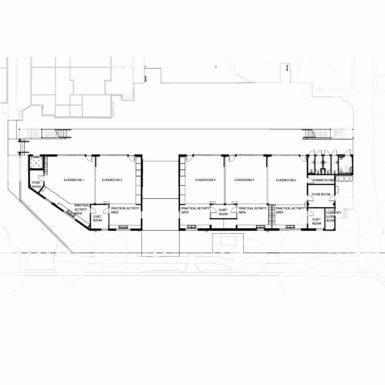 Visual elements embedded into the new building’s design facilitate out-of-class learning opportunities. 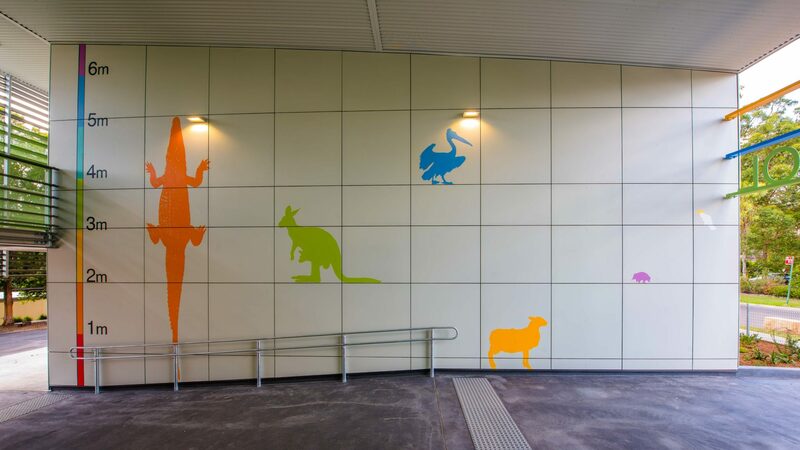 The main entry passageway has life size silhouettes of animals found in Australia painted on the walls. 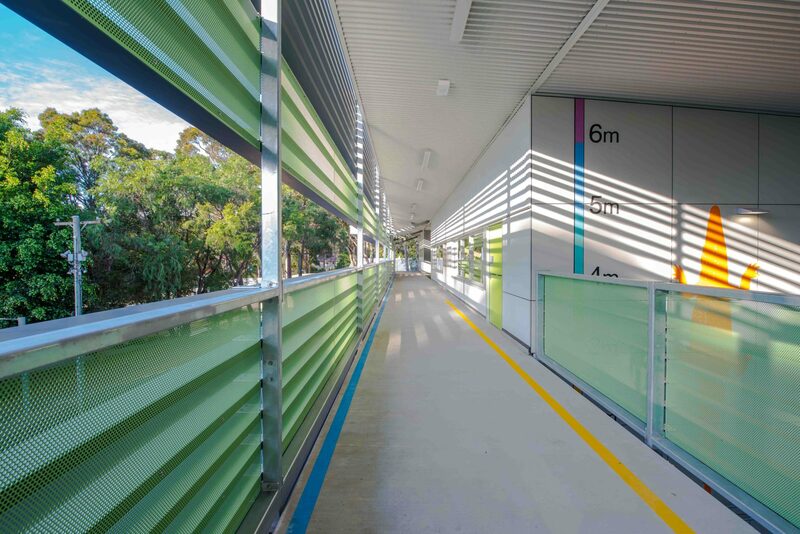 Symbols on the main entry path shows the sun’s movement throughout the year and the first-floor walkway compares metric and imperial measurement with painted lines and numbers indicating lengths. 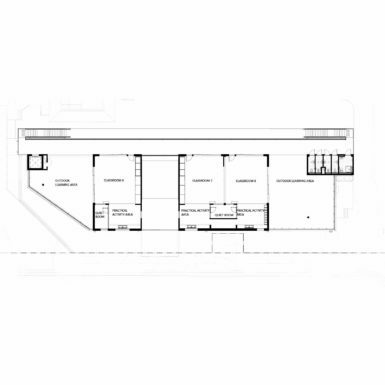 The new building implements passive design strategies. 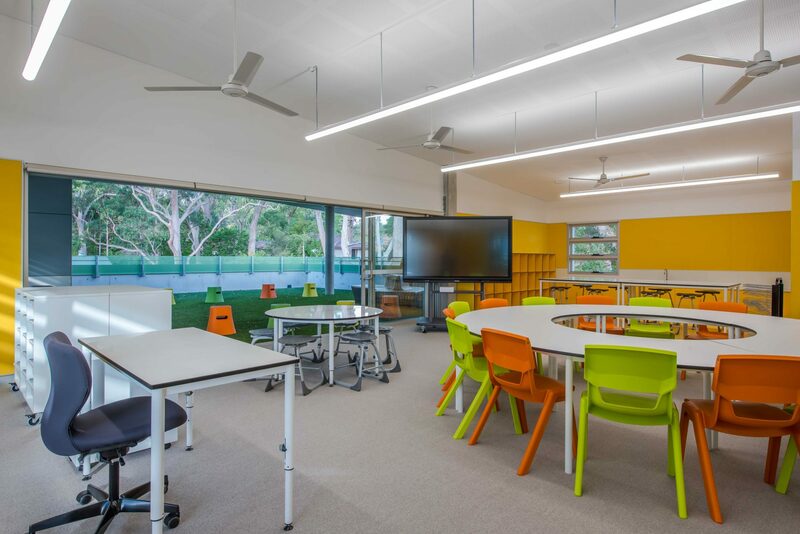 Homebase windows open to the north and south for cross ventilation, rainwater is collected and used to irrigate the native landscaping, solar panels on the roof contribute to the school’s daily power requirements. 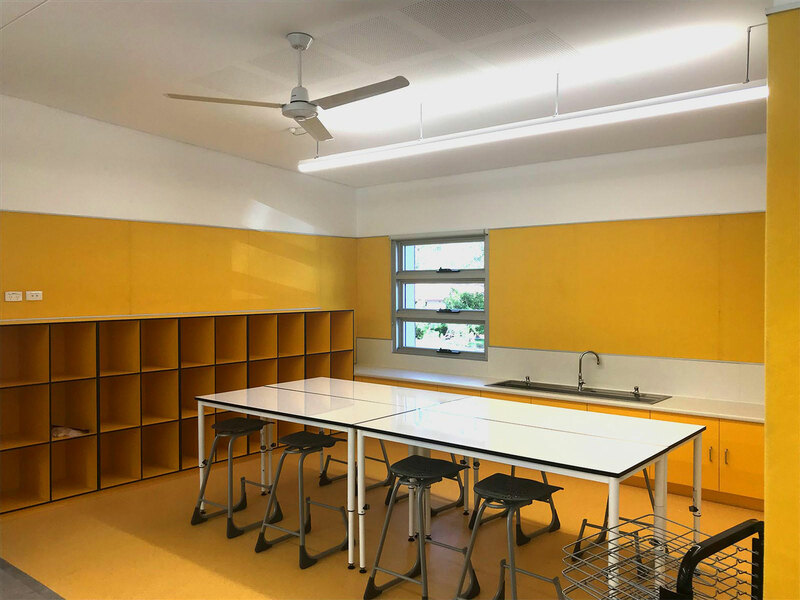 Each class room features a bright citrus colour; orange, yellow or green. 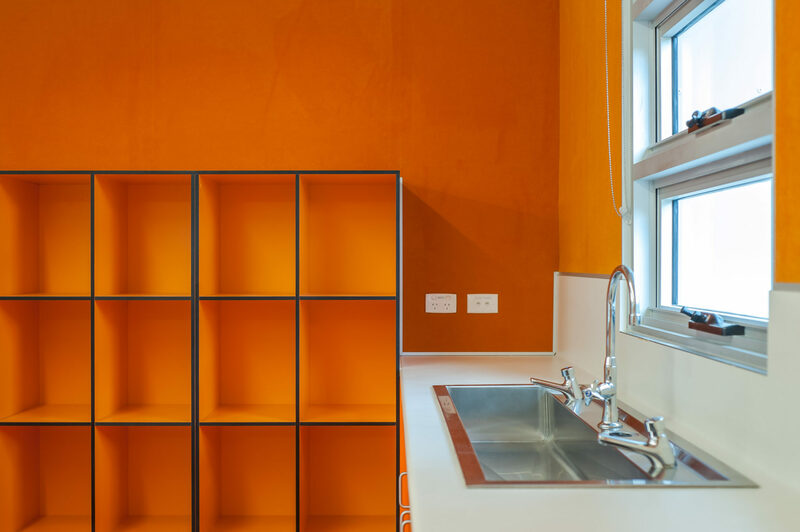 The feature colour is used on a range of surfaces including homebase doors, furniture colours, vinyl flooring in the practical activity area and pin board wall linings. 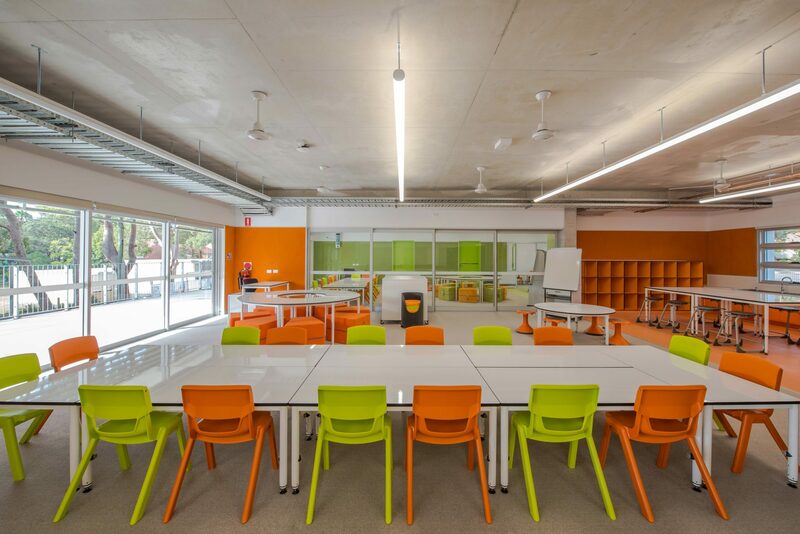 The colours complement each other, providing a fresh vibrant palette to new building whilst providing a unique identity to each homebase.